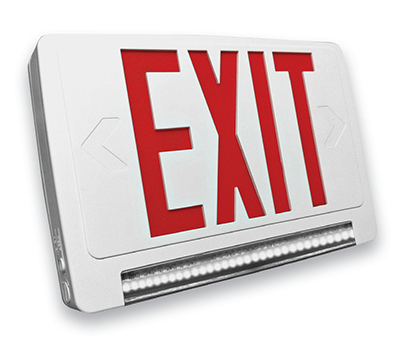 Lightpipe LED Exit sign has a unique design that combines exit illumination and low-profile emergency lighting. 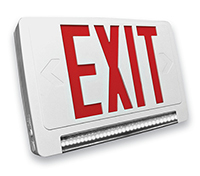 LED lights provide a maintenance-free, long life for your exit sign. • Sign features an easy to install face you snap together. • J-Box mounting system allows the sign to be displayed on ceiling, wall or end mount. • Sign has a UL recognized NiCad battery. Sign is also UL listed for damp location and a 90 minute emergency run time, 24 hour recharge time. • Remote capable - up to 2 CLED remote heads can be installed. • Sign has overcharge protection, 120/277V dual primary, 60Hz input. • Universal style – includes 2 face plates (for double-face applications), a back plate and mounting canopy. • Any component that fails due to manufacturers defect is guaranteed for 3 years with a separate 5 year pro-rated warranty on the battery. • Red LED has long life and is energy efficient. UV stablized Light pipe is adjustable for high performance, smooth, chrome-plated, metallized reflector and acrylic for optimal light distribution. • In cases of emergency can operate one or two lamps for a minimum of 90 minutes. • NiCd battery has a 4.8V long life, is maintenance-free and rechargeable. • Includes 2 directional chevrons, face plate closure, universal K/O pattern on the back plate for wall mount and mounting for top or end mount. Additional options for self diagnostic, black face plate and green letters available. • Meets UL924, NFPA 101 Life Safety Code, NEC, OSHA, Local and States Codes. Also is UL Listed for damp locations (0°C-50°C). Select self diagnostic option for your sign. Select black face plate option for your sign. Select green letters option for your sign.